You still have until Sunday to enter to win a Wii console and a Wii Fit Plus package! So if you haven’t entered yet… go do it! A few months ago I was meeting up with my ladies for happy hour. As my dear Nichole sat down, she handed me a page torn from a magazine and said in her sweet tone, “Would you make that for me!? 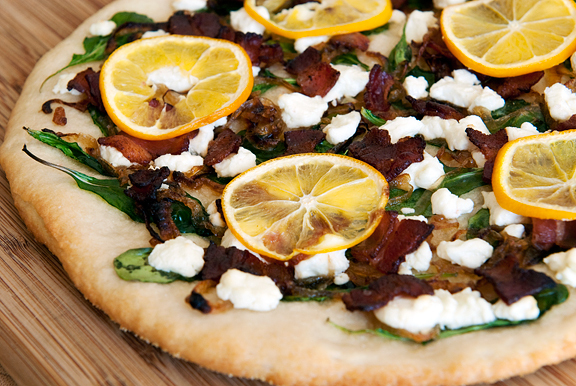 It looks sooooo good!” It was a picture of a pizza with lemon slices and greens and bacon – maybe some caramelized onions? It was lovely. “Sure!” I said, as I looked around for a description. Oops, that was on the other page, which was still connected to the magazine which was… not here. It was in my queue of recipes to try when Nichole posted on her FaceBook page that she and Luke had made the pizza. I was still determined to try it. Of course, my memory of the photo was further diminished after having recycled the page. You can tell this is going to be a winner. But really, I just don’t see how you can screw up pizza – or flatbread. What is the technical difference? I don’t know and I’m too lazy (busy?) to google it, so maybe one of you experts can lay it on me. I figured the combination of toppings would be better served with an olive oil drizzle rather than any sort of sauce. And for some reason, I wasn’t in a gooey cheese kind of mood, so goat cheese it was. Caramelized onion is fabulous on flatbread (now I’m calling it flatbread), but whenever I start caramelizing onions, I am never sure it will become what it is supposed to become. 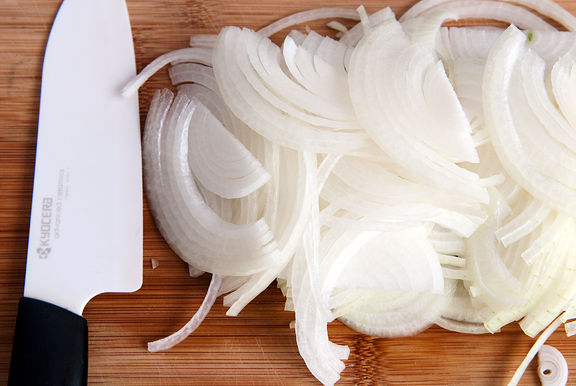 It usually looks like sautéed onions right up until (and for me – past) the point where you think it’s not working. It’s a magical transition much like the how the messy hot cream and chopped chocolate suddenly evolves into a velvety dark ganache before your eyes. Use your favorite pizza dough. If you know how to toss (I don’t and when I tried, we had a near disaster) then toss, or you can stretch it and roll/press it out. We still don’t own a pizza stone so we use a shallow baking sheet. Jeremy heats it up at 500°F in our oven while I prep the flatbread on foil on another sheet. When we’re ready, we slide the aluminum foil onto the hot sheet. It works for us. I sliced the lemon as thin as I could, but the Meyers are softer than regular lemons and I could only achieve wafer thin qualification with half of them. The whole slices are so much prettier on the flatbread, but I’ll tell ya, they’re hard to eat. It’s tough cutting your teeth through the rinds without pulling the whole slice off. My own preference would be to further slice them into quarters or sixths and sprinkle them on top. This sort of recipe is more of a suggestion than a recipe. Swap out the dough with whatever you prefer. Make your own combination of toppings. 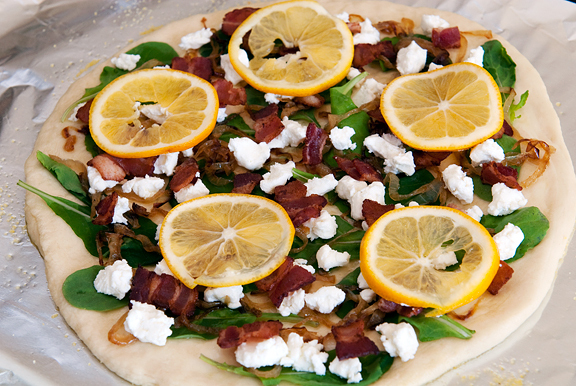 I have to say that this combination of flavors and ingredients is remarkably light (no sauce or gooey cheese) and bright (lemon and arugula) and yet still substantial (bacon and caramelized onions). I don’t even know if this is what was in the original magazine page Nichole had given me, but if not – I’m still glad she inspired me to give this a try. Make the pizza dough. While the dough is rising, heat 1-2 tablespoons of olive oil in a wide sauté pan on medium-high heat. Add the onions and sauté. Add a little salt to taste. Continue to sauté for 10-15 minutes until the onions become soft and brown. Remove from heat. Cook the bacon to desired crispness. Drain and set aside. Preheat the oven to 500°F with pizza stone or thin baking sheet on the middle rack. 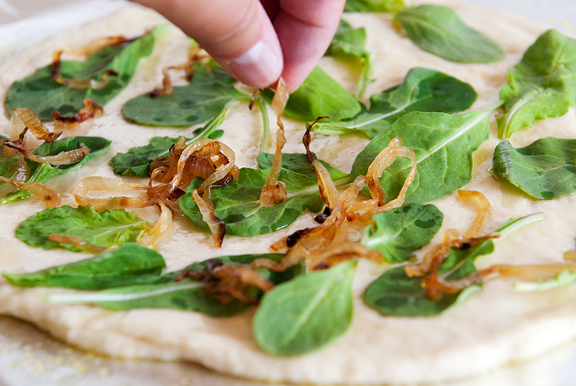 Prepare the dough to your liking (we make four thin-crust 12-inch rounds from one recipe). If using a paddle (I don’t even own one, so I’m guessing here) sprinkle some cornmeal onto the paddle and set the stretched dough atop. If using foil (like we did) rub a little olive oil on the foil and then sprinkle some cornmeal over it before dropping the dough on the surface. Mine never stretches properly (because of me, not the dough) and so I usually press the edges out once it is on the work surface. 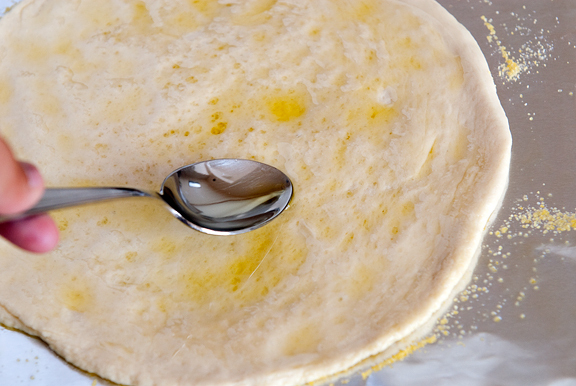 Drizzle some olive oil over the dough and spread it evenly. 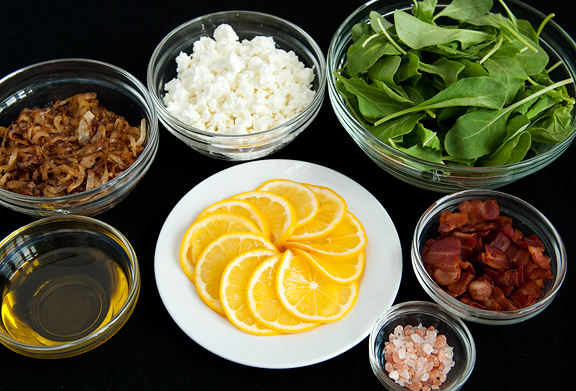 Sprinkle some salt and then distribute the ingredients: arugula, caramelized onions, goat cheese, bacon, lemon slices. Slide the flatbread onto the stone or sheet in the oven (we just take the sheet out of the oven, slide the bread over and pop it back into the oven) and bake for 5 minutes or until desired doneness. I like when the bottom of the bread is just golden. Serve hot. This is why I love you. That is all. My husband things caramelized onions are code for “fancy food” but that looks AMAZING. I’ll take fancy food any day. Pink Salt = Salt Peter?! Shaun – (I’ll take this because it sounds like Jen is swamped lately!) Pink salt and saltpeper are definitely not the same thing. Pink salt is salt (NaCl) with impurities that make it pink and change the flavor a little. Saltpeter is potassium nitrate, a different chemical completely. Glad you’re feeling better! I’m thinking prosciutto here. Yum. REST… I know that word is foreign to you, but please take good care of yourself. Hugs and kisses are sent your way. Holy crap–you’ve pretty much named all my favorite things and stuffed them onto one pizza. Lemon? Check. Goat cheese? Check. Bacon? Double check. I love the citrus burst! Very nice. Glad you are feeling better. Take care! Got an image of you sitting up in the OR w/ your laptop (wonder where the camera was?) working away DURING your surgery. Hope all is well. 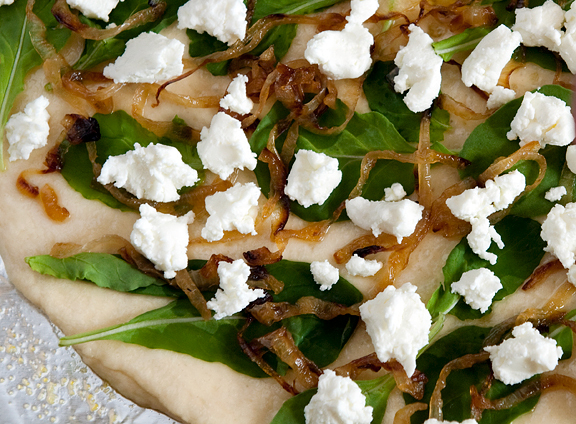 Caramelized onions on pizza…YUM. Now how about some roasted capers, mushrooms & artichoke hearts? If you’re ever in KC, go to Spin…wonderful pizzas & salads. Girl, you are about as tough as they come! Rock on. Glad you are feeling better, sweet. That pizza looks delightful–and now Nicole has taught me that I can just bring you a recipe and beg you to make it for me. Much better than doing it myself! What a beautiful pizza!! I love how you decorated even the ingredients before placing them on the pizza. I wish I had your patience and attention to detail. Gorgeous. Never thought to put lemon slices on pizza before, but I’m loving the idea. Wow Jen, glad that you are on the mend. The pizza looks lovely. I seem to remember a calzone with lemons and goat cheese with thinly sliced carrots and tomato sauce at a restaurant in the Rockridge area of Oakland, CA back in my post-college days. The lemon was thinly sliced and then cut in fourths or eights and the rind was intact but soft enough to eat. Boy, was that good! Jen — All’s right with the world when the anaesthesia wears off and you’re cooking again. Welcome back to well. The combination of flavors seems so unique. But they seem like they would work very well together. I’ll have to try this sometime. Thanks for sharing. Hope you are feeling back to normal very very soon…am sure Kaweah kisses help! Arugula sounds divine! Goat cheese — not so much. Maybe Feta? Anyway, it looks great! Hope you’re feeling back in top form soon! Glad to see you’re feeling better :) This looks deelicious! Yum! 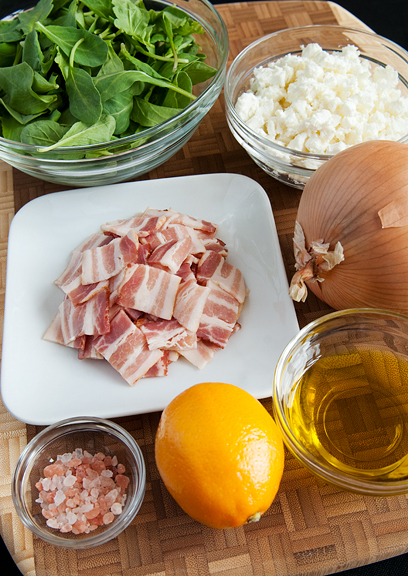 Three of my favorite things: goat cheese, bacon and arugula! Can’t wait to try that combination on a GF pizza crust. Thanks for sharing. and glad you’re feeling better! Mmmmm this looks amazing! And definitely something I never would have thought of. I can’t wait to try this on the grill! My current “oh I wouldn’t have thought of those toppings” pizza are basil pesto topped with pear, carmalized onion and brie. But now that I think about it bacon will probably be lovely too! That looks absolutly amazing! I love goats cheese and I can’t wait to try this! Bridget – yeah, we don’t want Shaun eating saltpeter! Kath – ptttttth! Thanks love! Nan – yes, I was also thinking feta. I love both goat cheese and feta, so either one would be a hit for me! Betsy Gluten Freedom – I love your blog name. I didn’t know you were having surgery but I’m SO glad you are feeling better now! I love how you were negotiating with the doctor so you could blog…totally something I would do. This flatbread looks fantastic. Do you just eat the lemons like that? Who wouldn’t love flatbread?! You just rock it again! Have you owned a pizza stone, yet?! You Must, you Should, you Really need to, you Absolutely have to, you definitely must!!!! Get my message?! !